Desk storage is usually an afterthought until you need it. Keep the desk clutter in check with the UPLIFT Half Circle Drawer. 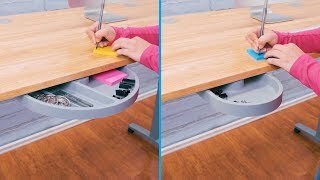 It easily mounts under your desk, allowing you to swivel your way to a better workflow with its built-in organizer system, making it perfect for storing anything from pens to keys to sticky notes. A central mount system allows for quick access by pushing either side of the UPLIFT Half Circle Desk Drawer to rotate it open and easy storage by swinging it back under the desk for a sleek look you can appreciate. How does this attach to the desk? The drawer can be screwed into your desktop at the center. This allows it to rotate out for access to the contents of the drawer, and back underneath your desk for easy storage. Can I install a half-circle drawer on an Eco curve? Yes, you absolutely can. You may just need to recess the drawer slightly to ensure that it remains fully hidden while closed. Can I have the half circle desk drawer and the keyboard tray on the same desk? Yes, you certainly can even if you have a smaller desktop! The half circle drawer hugs the desk, while the tray can lower beneath it. Can I install two of these on the same desk? As long as you have the space under your desktop, you can install multiple drawers. Call our Sales Pros if you're unsure if you have enough space and we will give you some guidance. Do you sell any drawers that are bigger than this one? We sell the Pelican but it doesn't work with the UPLIFT Desk crossbar because you need at least 23.375" of clearance underneath your desk. The UPLIFT Half Circle Desk Drawer is available in your choice of black, gray, or white to match your frame and desk accessories. This product comes standard with a 1-year limited warranty. $49.00 List Price: $79.00* The list price is the same as the MSRP (Manufacturer's Suggested Retail Price). It may not necessarily be the price at which the product is sold.